Really the title says it all. I was looking for those thai flavours, I didn’t want thai food calories, and I had extra lean ground meat staring at me daring to do something with it. Well…something had to be done! Done it was…and tasty. Combine the first seven ingredients in a bowl. 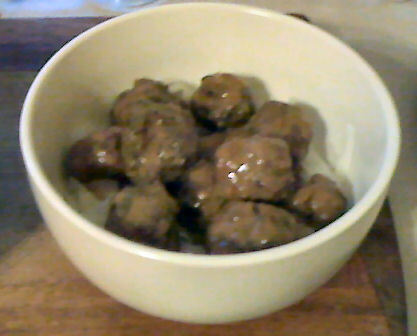 Form the mix into meatballs, typically around 40 of them and place on the cookie sheet. While they cook combine the remaining ingredients in a crock pot. Whisk them all together. Add the cooked meatballs to the crockpot. Stir. Cover. Cook on low for 3-4 hours. Each meatball is approximately 45 calories each based on 40. If you make more or less simply divide 1800 by the number of meatballs you actually made to get the approximate calorie value of your meatballs. I serve these on a nice bit of rice noodles and with a lovely side salad with ginger dressing. Then close my eyes and pretend I’m in Thailand. hehe. This entry was posted in Crockpot Creations, Dinner and tagged Beef. Bookmark the permalink.